There are lots and lots of different ways for you to keep your business promoted amongst these times of high competition. Just one of those simple ideas is to have your business details and company logo printed onto the sash on our Honey Bear with Advertising Sash. Each of our Honey Bears with Advertising Sash comes with your business details and company logo or message of any kind printed upon the sash that the bear is wearing. The little fella is 5 inches tall with jointed hips for full virtual movement. 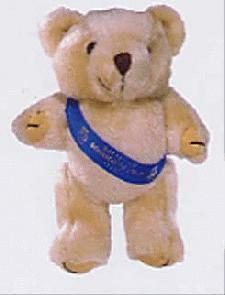 So advertise your business details and company logo upon our Honey Bear with Advertising Sash today! To find out more about our Honey Bear with Advertising Sash click here and fill in the contact form and we'll get straight back to you. Other promotional and personalised items besides our Honey Bear with Advertising Sash click here.